Bobbi Kristina Brown turned to shopping for some much needed therapy following her mother’s death along with her boyfriend and foster brother Nick Gordon. They were seen making their way through the Target carpark in Atlanta, Georgia. Bobbi Kristina Brown, 19, wore a mask of indifference as she puffed on a cigarette, clasping in her hand both a blended coffee drink and her cigarettes as the couple made their way back to the car. Whitney Houston’s daughter was dressed in a nearly all black ensemble, featuring a black leather jacket, grey and black striped shirt and black trousers along with black trainers. She kept her face down and expressionless. 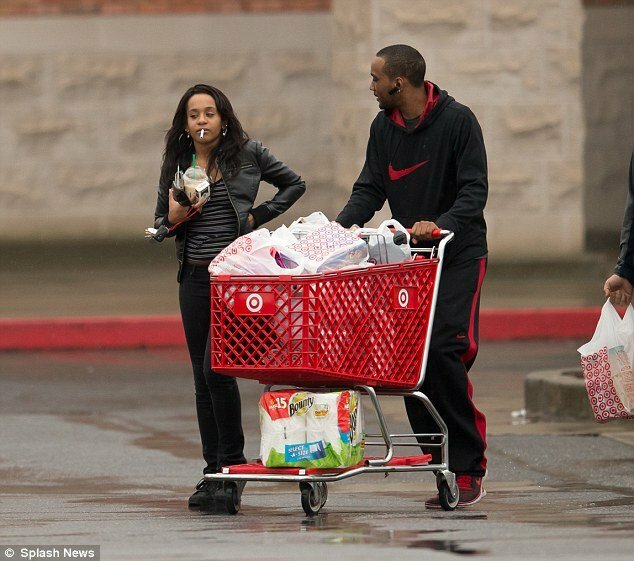 Bobbi Kristina Brown let Nick Gordon, 22, who was dressed down in a red and black tracksuit, push the trolley full of purchases. Four days ago, Bobbi Kristina Brown and Nick Gordon hit up another store in town where they bought a small flat screen television among other things. Once again, Bobbi Kristina Brown occupied herself by smoking a cigarette while wearing a blank look. Even as she struggles with the loss of her mother, Bobbi Kristina recently was quick to speak out about her grandmother Cissy Houston’s book Remembering Whitney.